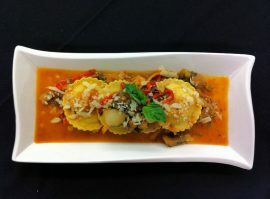 Sweet Corn/Polenta Ravioli with summer tomato ratatouille topped with the fine olive oil. 1. Sweat onion and garlic in 1 T olive oil for 5-7 min. 2. Add eggplant, peppers, and tomatoes, sweat an additional 5-7 min. 3. Add 2 oz. of stock and bring to a simmer until vegetables are tender. Use remaining stock if needed to thin sauce for desired consistency. 4. 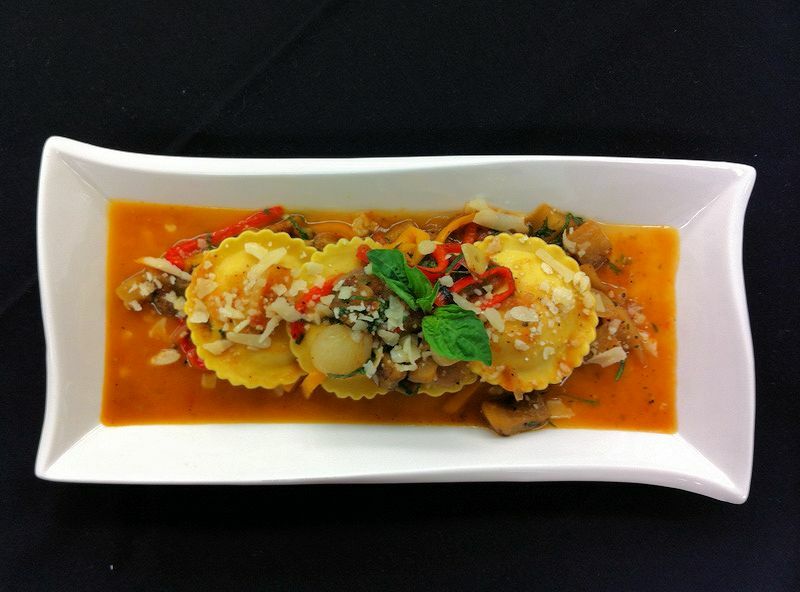 In a pot of salted/boiling water, cook ravioli for 5-7 min, strain and add to eggplant ragu. 5. Add basil, salt and pepper to taste and finish with olive oil.